After a month-long hiatus, I am back at the keyboard and ready to resume telling the story of Early Modern alchemist Antonio Neri a few paragraphs at a time. To my regular readers, thank you for your patience. To those who are new, I hope you will find material here that makes you want to come back for more. "Conciatore" is the name used in seventeenth century Florence to describe the specialist who prepared batches of glass from raw materials. Catholic priest Antonio Neri was one of these, and he is best remembered for writing the first printed book on the subject of glass formulation, in 1612, called L'Arte Vetraria . This recipe book contains over a hundred different preparations that range from the commonplace to the spectacular. The book would go on to become the bible of glassmakers throughout Europe and what Neri became famous for, but the man himself became something of a mystery. Less than fifty years after his death, his first translator, British Royal Society fellow Christopher Merrett wrote in 1662 "Concerning our author, and this work, I find no other mention of him." This would become the standard line on Neri for next three centuries; an enigmatic figure, fabled to have been chased out of Florence by thugs seeking to learn the secret of the philosophers stone, which purportedly could transmute base metals into gold. Passages on Neri written by eighteenth century historians Giovanni Targioni-Tozzetti and Francesco Inghirami went unnoticed or ignored and recognition was complicated by the move to distance 'real science' from alchemy. In the early 1960's Venetian glass historian Luigi Zecchin, working with Florentine scholar Enzo Settesoldi, located a birth record which seems to be a match for the glassmaker . They also found the marriage record of his parents, Neri and Dianora, birth records for some of his brothers and a cache of letters to Neri from a rich banker friend, Emmanuel Ximenes. Research was interrupted in 1966 by the disastrous flood that devastated Florence. When the city dried out, the hunt for Neri's trail was resumed, notably by Paolo Galluzzi in a 1982 book on Paracelsianism  and in the 1983 thesis and related research by Maria Grazzini, a student of science historian Paolo Rossi. It was becoming clear that Neri possessed other intriguing dimensions besides that of a glassmaker. He was a dedicated Paracelsian experimentalist who worked in his father's field of medicine as well as in a much broader context of chemical investigation. What makes much of his work so very interesting is that unlike many of his contemporaries, Neri sometimes took pains to write in clear, uncoded language that exposed rather than concealed the alchemist's methods. In this way he serves as a sort of bridge to some of the more obscure alchemical tracts, like the notebooks of his disciple Agnolo della Casa. In 2002, I identified two previously overlooked manuscripts by Neri. One is a copy of work done shortly before his death, sighting Pisa as his location. The other, Tesoro del Mondo, [Treasure of the World] is a lavishly illustrated work dedicated to “all of alchemy.” It contains dozens of color illustrations drawn by the priest's own hand. It was started in 1598, when he was just finishing as a student at seminary. Both tracts were mentioned briefly by George Farrer Rodwell in the 1870s, when they were apparently first brought to Scotland and ultimately became part of the Ferguson collection at the University of Glasgow. The Treasure of the World is a bound, handwritten volume currently on public display in Düsseldorf at the Museum Kunstpalast (through 10 August 2014); The Art and Alchemy exhibit there is well worth the trip to this lovely city . In 2007 I finished publishing a three part translation of the glass book  and in 2011, Pieter Boer and I coauthored a bibliographic survey of all that was known to have been written by, to or about Neri during his lifetime . The astonishing finding was that in fourteen documents by Neri, twenty-seven letters addressed to him and thousands of pages recording his experiments by fellow alchemist Agnolo della Casa, the only references to glass are in his famous book and several paragraphs in the letters. All the other material deals with the subjects most important to Neri himself; chemistry and medicine. Last year, Maria Grazzini published a translation of Neri's Discorso Sopra la Chimica , in which Neri explains his chemical philosophy, and offers a number of recipes for transmutation in plain language. In the course of her research, Grazzini discovered that the manuscript had been plagiarized in its entirety by the Jesuit polymath Francesco Lana-Terzi as a chapter of his 1670 book Prordromo . Lana-Terzi has become known as the father of aeronautics, for his airship designs. On this, the four hundredth anniversary of Neri death, the future looks brighter than ever for further study. Later this year Laboratories of Art, ed. Sven Dupré , will explore alchemy in the service of Early Modern crafts. It will include a chapter by Marco Beretta about the facility where Neri worked in Florence  and another by Fanny Kieffer on the laboratories at the nearby Uffizi palace . Christine Göttler, Sarah Joan Moran and Sven Dupré have a new website devoted to Emmanuel Ximenes, which promises to publish the letters from Ximenes to Neri in English translation . 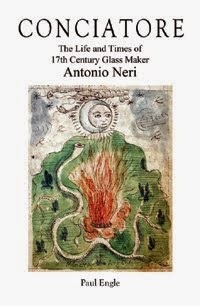 Finally, my book, Conciatore, The Life and Times of 17th century Glassmaker Antonio Neri will also be published . Luigi Zecchin, Vetro e vetrai di Murano: Studi sulla storia del vetro, vv. 3, Venice: Arsenale, 1987. Paolo Galluzzi, “Motivi Paracelsiana nella Toscana di Cosimo II e di Don Antonio dei Medici: Alchimia, medicina, ‘chimica’ e riforma del sapere,” in Scienze, credenze occulte, livelli di cultura, Istituto Nazionale di Studi sul Rinascimento, Florence: Leo S. Olschki, 1982, pp. 31–62. [Italian]. Antonio Neri, L’Arte Vetraria, The Art of Glass, Paul Engle ed. ( Hubbardston, Mass: Heiden & Engle, 2003–2007), vv. 3. Pieter Boer and Paul Engle, “Antonio Neri: An Annotated Bibliography of Primary References” in Journal of Glass Studies, v. 52 (2010), pp. 51-67. Marco Beretta “Material and Temporal Powers at the Casino di San Marco (1574–1621)” in Laboratories of Art, Archimedes Volume 37, 2014, Springer, pp 129-156. Paul Engle, Conciatore, The Life and Times of 17th Century Glassmaker Antonio Neri, Heiden & Engle, 2014.